Fires at scrap yards and recycling centres remain a big problem. 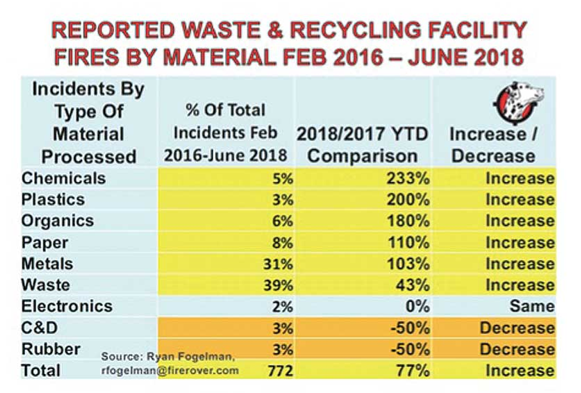 In the past 12 months, there have been 377 reported fires at waste and recycling facilities across the US and Canada. This number only states the fires that were officially reported to the authorities. It is likely the real number of incidents is a lot higher – possibly exceeding 1800 fires annually. The industry has seen a 77% year-on-year increase in incidents related to fires in the first six months of 2018 alone, according to Ryan Fogelman, and VP of fire safety solutions company Fire Rover. He estimates that the 1800+ fires taking place on average every year translate into almost 40% of waste and recyclign facilities in Canada and America experiencing a fire in the past 12 months. Metal fires traditionally make up about 30% of fire incidents – but are said to have ‘more than doubled’ so far this year in comparison with the same period in 2017. The causes of these fires range from traditional material hazards such as propane tanks, fertilizers, hot work activities, hazmat, smoking and chemicals to new hazards such as electronics and lithium-ion batteries. Climate change induced heatwaves and a waste build-up due to China’s import restrictions are cited as other factors. How to lower your risk profile? Install thermal cameras—automatic thermal detection, often sensing dangerous temperature differentials before a fire even starts. Ensure remote, human verified, manual control of the foam agent dispenser from a safe location. Ensure that a pathway is maintained for the fire professionals to safely enter the facility where the fire department has been trained to arrive. Have a working automatic sprinkler system and adequate water supply. The water supply may be lacking at some locations, so having a tank system and early detection solution is very useful. Have a solid ‘human training’ programme. This means regular inspections and testing of fire equipment of all types, being ready for a fire event with a simple but effective fire emergency response plan and good housekeeping, contractor and hot work controls are essential. Have secondary rally points in a safe place, potentially even off-site, for personnel that can remain and help the fire service (e.g., in effecting safe plant shutdown, operating crane, etc.). They may wish to have personnel leave the site either immediately or shortly due to smoke and the need to assure personnel safety. Insurance: what is the best bet? Insurance is considered the last line of defense. If the insurance policy is paying out a fire loss claim, there have been failures in prevention and suppression efforts. Property insurance coverage is one of the more complex lines of coverage and requires some basic understanding by the owner/operator who is purchasing it. Business owners typically request that their brokers provide them with the least expensive insurance options. In many cases, lower premiums provide more limited coverage. It would be wise to estimate carefully what equals being ‘properly protected’, rather than worrying about being over-insured. It is important that the owner/operator and insurance broker discuss what level of insurance coverage is desired. Deductibles—Most insurance policies have deductibles. Business owners that are willing to accept higher deductibles can achieve premium reductions while maintaining fundamental coverage of the items that are desired in the event of a loss. Co-insurance—Not insuring property to the right value can create a risk. The loss payout could be subject to a co-insurance penalty, reducing the amount the owner receives to rebuild the assets of the business. The safest bet is for co-insurance to be waived and an agreed value noted on the policy. This typically carries a slightly higher rate/premium, but is a good cost to value expenditure. Business Income—Business income provides payment to businesses that are not able to operate because of a property loss. This can be an essential coverage that allows a business to survive in the event of a property loss. The business owner must decide if this is an important coverage item based on their ability to earn revenue if their loss prevents operation at the location. A business income worksheet is often completed to determine the proper limits of coverage that are needed. Do not skip this step. Estimating limits without completing this step can often lead to underinsured losses, which can lead to business failure. Ordinance and Law—This coverage provides additional claim dollars for building code upgrades that are required by the local jurisdiction in the event of a rebuild or significant remodel of a property. Lower cost property insurance policies often exclude this coverage, which can cost well into six figures and should be considered an essential coverage item. About the authors: fire prevention specialist Ryan Fogelman wrote this white paper together with John Schumacher, who has 25+ years’ experience as a safety professional and insurance broker, and Jim Emerson, who is an engineering manager for Starr Tech, which specialises in insuring commercial industrial risks.